Today OdnetninI user presents his second homebrew on this page. For lovers of the classics and also for those Pokemon Poke-Pong gets a pong style game with two game modes which are Fronton and 1P vs 2P. Surely this game will appeal to many because it uses very well the capabilities of the DS such as touch screen, the use of 6 of 8 buttons, sound and dual screen among other things. This is a very good homebrew made especially for all fans of Pokemon, as well as being fun, it's very visually appealing. As mentioned we can choose between any of the 2 modes of play. And 1P vs 2P mode can play in the company of a friend, but not wirelessly, if not, using the D-Pad and buttons on the DS. The following additional data were provided by the author. This homebrew has been inspired by the game Pokémon Pinball: Ruby & Shapphire . The pokeball used is "Moon Ball". The scenario is based on games Gold Heart / Soul Silver NDS. 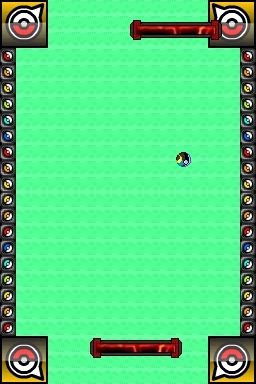 The intro screen is similar to that of Pokémon Platinum. The intro music is the 1st season of the series. Stylus / D-Pad: Player 1. Digital Pad Up / X: Removing the pokeball. A / Y: Player 2.